Or: What a difference a full tank of gas can make! 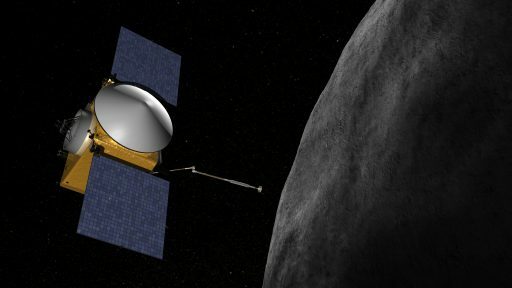 The conceptualization of the OSIRIS-REx asteroid sample return mission was constrained by the typical factors governing space missions – starting with budgetary considerations which in turn impose upper limits on the launch vehicle cost and thus limit the spacecraft’s mass. Mission analysis performed early in the mission design process yield a delta-v budget concerning the change in the velocity required from the spacecraft to achieve the expected flight trajectory and succeed in returning sample material from asteroid Bennu. 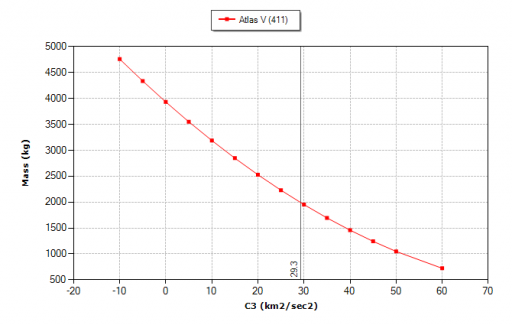 This calculation determined the amount of propellant that must be carried aboard the spacecraft to meet the mission objectives and, together with the launch vehicle performance, puts an upper limit to the spacecraft’s dry mass. 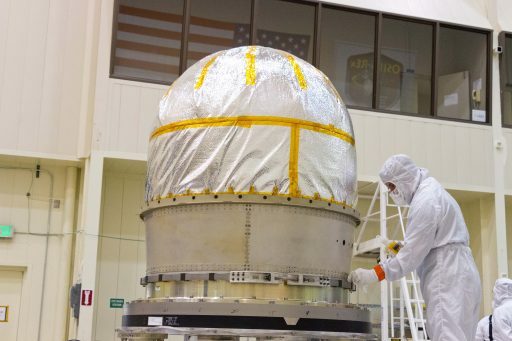 However, OSIRIS-REx gained some welcome flexibility late in its development process that gives the mission a number of options to either extend its scientific return or shave off a year of deep-space travel. Typically, all spacecraft missions aim to maximize the spacecraft mass, exhausting a launch vehicle’s throw capability to the desired trajectory. OSIRIS-REx was assigned to an Atlas V 411 launch vehicle which – when the mission was designed – was capable of delivering 1,955 Kilograms to the expected Earth Escape Trajectory with a characteristic energy (C3) of 29.3km²/s². To complete its seven-year journey to Bennu and back, OSIRIS-REx requires a delta-v of around 1.4 km/s, plus propellant for attitude control & reaction wheel unloading, plus a margin for unforeseen contingencies. 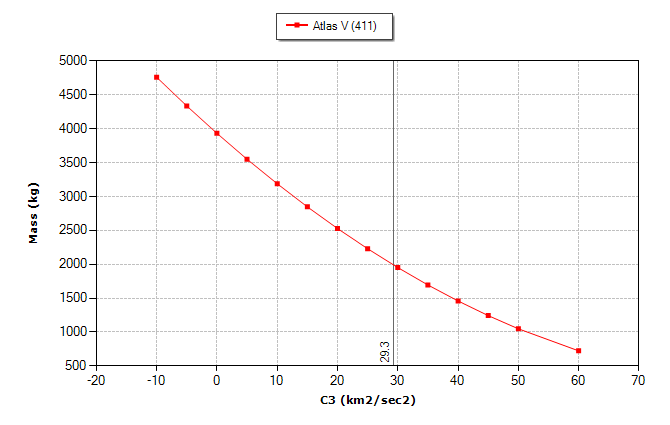 Mission Design analysis concluded that a propellant mass of 1,095kg was needed, placing an upper limit of 860 Kilograms on the spacecraft’s dry mass. 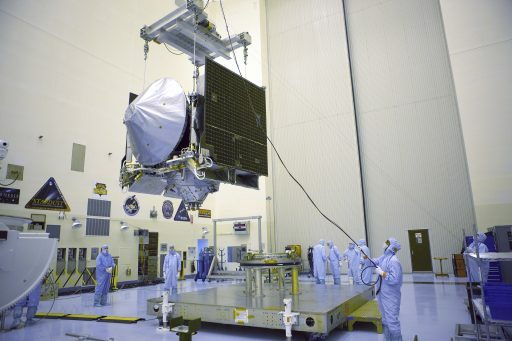 Development and manufacture of the spacecraft components showed that 860kg was a realistic goal with OSIRIS-REx likely to come in below that mark. Between the Mission Definition and Design and the actual launch date of OSIRIS-REx, several years passed and the Atlas V continued to mature. While improvements on the launcher such as mass reduction increased its performance, a better understanding of the precise capabilities of the vehicle also contributed to a higher launch mass that can be supported for OSIRIS-REx. An initial review of launch vehicle performance for the 39-day launch window and fixed C3 showed that at least 123kg of additional performance were available. Luckily, the spacecraft design includes a healthy margin in propellant tank size. The planned 1,095kg fuel load would take up 88% of the fuel tank which has a maximum capacity of 1,235kg for a maximum possible spacecraft mass of 2,155kg. 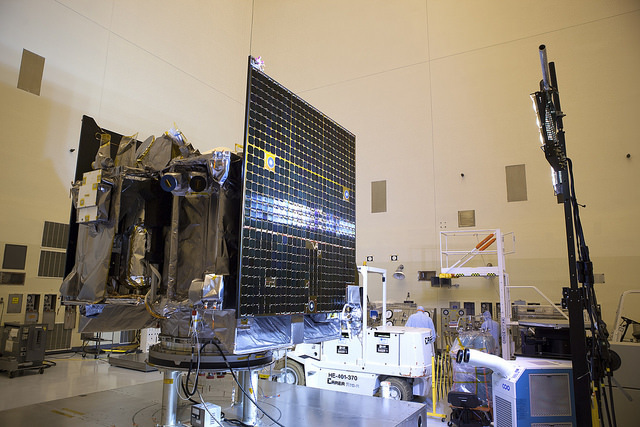 This built-in feature allows OSIRIS-REx to take on additional propellant based on its dry mass and final launch vehicle performance assessment, maximizing flexibility for the mission. The major benefit of the extra fuel on board is giving the mission options, specifically an Early Return or Late Departure. 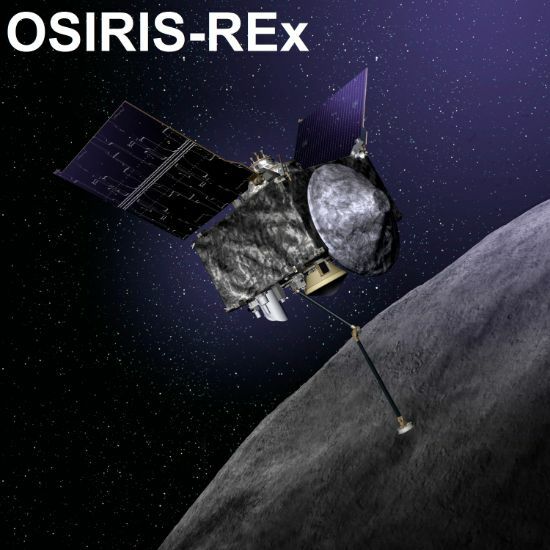 Per the baseline mission plan, OSIRIS-REx launches in September 2016, arrives at Bennu in 2018, departs in March 2021 and returns to Earth on September 24, 2023. 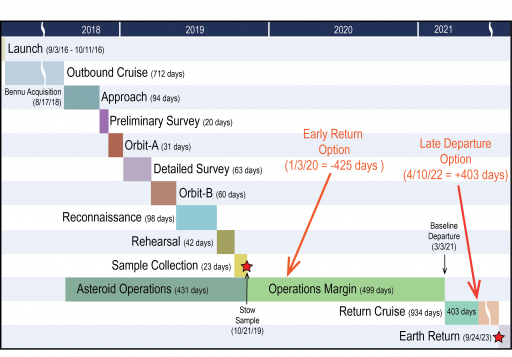 The Early Return option would require OSIRIS-REx to make a much larger Asteroid Departure of 935m/s on January 3, 2020 as compared to a 328m/s burn for the 2021 departure. Returning a full year ahead of the baseline schedule would allow for sample analysis to begin one year earlier than currently planned. 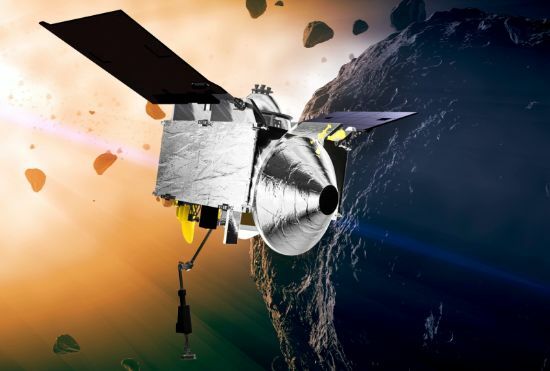 The Early Return would cut 425 days from the observation campaign at Bennu which will require scientists to weigh the expected return of these 425 days against the added risk of keeping OSIRIS-REx in space. Should Bennu prove out to be an exciting scientific target where additional time spent with science could deliver valuable insights, a Late Departure could be selected, taking advantage of extra propellant loaded before launch. These mission scenarios would keep the September 2023 return and use surplus propellants to speed up the spacecraft’s return journey. The mission’s latest departure has been identified as April 10, 2022 after 1,333 days at the asteroid. The mission does not have to commit to any of these scenarios until after OSIRIS-REx arrives at Bennu and scientists can get a look at the target. The primary aim before launch is to maximize the mass of propellant carried by the spacecraft to maximize the flexibility teams will have once OSIRIS-REx has departed Earth which will increase the probability of mission success.